What stage of growth are they? 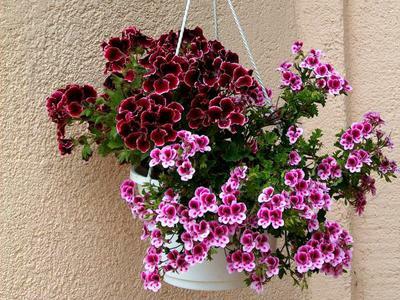 Lilian, geraniums (Pelargonium species) are commonly grown in pots on decks and patios. To those that like them, they are the epitome of summer. Don't over pot them. To trigger the bloom cycle, they need to fill the pot with roots, so a pot that's a little bit smaller than what looks comfortable will help with this - this is also why often you see geraniums in clay pots, for the weight. A good sized geranium plant tends to topple over if it's not in a heavy pot. Other things to try; don't over fertilize with fertilizer containing Nitrogen. This just encourages more vegetative growth. Use a liquid (water soluble) type fertilizer with numbers like 5-10-10 to get those blooms happening. Don't overwater them. Let them experience the stress of not getting quite enough water. This will often give them the right idea - produce flowers or die! And lastly, give them enough time to get old enough to flower. Tiny seedlings are just not mature enough to bloom - cultivate patience!